April 29, 2018 - I awoke at around 4:30 a.m. this morning and started thinking about today's comment. I wasn't able to fall back asleep, so I tossed and turned for nearly three hours as I tried to sort out my thoughts. I'd worked all day yesterday on today's comment. I'd awakened yesterday morning realizing that I needed to reduce the scope of the scientific paper I'm writing about Einstein's train-embankment thought experiments. I keep adding new things to it, and I've run into some topics which I do not yet fully understand, each of which requires that I do some research to see if I can figure things out and understand them. But that often leads to something else I do not fully understand, and that can lead to me never being done with writing the paper. “Special relativity is supposed to be reciprocal, where both parties will experience the same time dilation, but all the examples that we have right now can be interpreted as directional time dilation,”[University of Georgia professor Edward] Kipreos said. Like so many mathematicians, the author of the paper is saying that the idea that velocity time dilation is reciprocal is Einsein's theory. It's NOT. It is just what is being erroneously taught in many colleges as Einstein's theory. The author also suggests that if velocity time dilation is not reciprocal, if it is "directional" like gravity time dilation, then the whole idea of "dark energy" becomes nonsense. I've had thoughts along that line myself. Time dilation is reciprocal. If Δt is the proper time for a clock in S, then the two observers in S' would measure Δt' = γΔt. If this effect were not reciprocal, there would be a way to distinguish between inertial frames. The paper I'm working on shows how Einstein explained very clearly via his train-embankment thought experiments that you CAN very easily distinguish between inertial frames. You just cannot do it if you are inside a windowless laboratory where you cannot see any other inertial frame of reference. I can also find many places which seem to say, as Prof. Kipreos seems to have previously believed, that velocity time dilation is reciprocal but gravitational time dilation is not. Another such place is page 29 of a text book "The Geometry of Special Relativity - A Concise Course" by Norbert Dragon. But, I didn't find many that argue as Prof. Kipreos now claims, and as Einstein and I have always claimed, that velocity time dilation is not reciprocal. Maybe I just need to look harder. On the other hand, I found a very interesting article titled "What Happened to the Principle of Relativity" which says Einstein's theory was "deliberately ambiguous," and that contributed to its success. Yesterday I realized I need to break down my paper about Einstein's train-embankment thought experiments into two or more shorter papers. Plus, the first paper should specifically address Einstein's undeniable evidence that motion and velocity time dilation are NOT reciprocal. It seems to be the key to understanding a lot of other subjects. What I also realized this morning was that Einstein made a mistake of omission in his 1905 paper "On the Electrodynamics of Moving Bodies." His thought experiments involved logic, not mathematics. When he stated that his theory made the aether "superfluous," and that his theory did not require "an 'absolutely stationary space' provided with special properties," he was looking at things logically, and he evidently didn't realize how it would affect mathematicians. Mathematicians need "an 'absolutely stationary space' provided with special properties" to measure all movement against. If they do not have it, all movement becomes reciprocal. When Einstein didn't give them a replacement for the aether, the mathematicians had to assume that Einstein was declaring that all motion is reciprocal, and so is time dilation. It was the only way they could make sense of his theory. Today, I can give them the theoretical stationary point where the Big Bang occurred to use in place of their imaginary aether. But they prefer the aether. So what is the number 1 dumbest belief in physics? That has to be the view of the aether deniers. "nothing" of space can have properties. When it comes to electromagnetic phenomena, they suggest that behavior can exist without anything which possesses the behavior. It's clearly an insane view. Take the case of waves. Waves by definition are stresses in SOMETHING that can propagate outward from one point to another. Can one stress "nothing at all"? The question makes no sense at all. Hence if radio energy is waves then it is stresses of some kind in space that propagate outward. If space is "nothing at all" then WHAT is being stressed? The whole aether denier theory has sunk into a morass where only blind religious belief can save it from the mental hospital. It clearly is NOT science, so what is it doing there? Who are the "aether deniers"? Benj doesn't say, but I am certainly one of them. Einstein didn't deny the existence of the aether, he just said it wasn't necessary for there to be such a thing as the aether. Energy travels as photons through a vacuum, not as waves through some magical aether. "Benj's" argument is self-confirming. He wrote, "if radio energy is waves then it is stresses of some kind in space that propagate outward. If space is 'nothing at all' then WHAT is being stressed?" The obvious answer would be that energy does not travel as waves, it travels as photons, so the question is meaningless. Interestingly, one of the people on my "Do Not Reply List" found the argument to be compelling. "David (Kronos Prime) Fuller" was the first to post a response. He wrote "Your [sic] my best friend now...", and he provided a link to 15 papers he has on viXra.org, all in the Quantum Physics category. I checked out the one that has had the most views (46). It is 11 pages long and is just a mass of mathematical equations with probably less than 10 complete sentences, and those sentences are only there to explain factors used in the equations. It doesn't even have an abstract, nor does it mention the name of the author or the date it was finished. The same with his 2nd most viewed paper. My current plan is that I'm going to now look at pulling parts out of my paper about Einstein's train-embankment thought experiments to create a new, shorter paper tentatively titled "Motion, Time Dilation and Einstein's Train-Embankment Thought Experiments." It will explain how Einstein's experiments demonstrated that all motion is relative but NOT reciprocal. And it will also explain once again how Relativity works, since that is key to understanding how the thought experiments work. And it is something else the mathematicians simply do not understand. April 25, 2018 - My paper on Einstein's train-embankment experiments is now 19 pages long. I suspect it won't be more than 25 pages when I finish. I worked on it all afternoon on Sunday and all day Monday and Tuesday. That's why I haven't written any comments here since Sunday morning. And I may not write any further comments here until it's time once again for my regular Sunday comment. I can barely wait to put the paper on vixra.org, where others can read it. I really want to see what the people on Google's Science, Physics and Relativity discussion forum have to say - other than calling me names and saying they simply don't believe what my paper shows to be true. I also keep thinking I should try mentioning it on some Facebook physics pages, perhaps before mentioning it on the Google group, just to see what happens. He’s saying that his train-embankment experiments show that it can be determined by experiment that one object is moving relative to another (or moving faster than another) without any requirement for any “luminiferous ether,” and without all motion being reciprocal. It also helps that I can explain everything using Einstein's examples and words, without having to add my own ideas into the paper. If it can be determined by experiment that A is stationary and B is moving (or that A is moving slower than B), then there is no need for me to refer to the point where the Big Bang occurred as a place that is truly stationary. It is enough to show that it is possible via experiments here on Earth to show who is moving faster than whom, and that while all motion is relative to some other body, all motion is definitely and conclusively not reciprocal. In other words, I can tell that in reality I am moving away from you at a given velocity and that you are NOT moving away from me at that same velocity -- except in some incorrect mathematical model. Yesterday, Amazon sold a paperback copy of my book "A Crime Unlike Any Other." It's the third copy of my book that I've sold in the past two weeks. (The other two were Kindle copies.) I can't remember the last time that happened, but it was probably back in late 2012 or early 2013 just after my book was first published. 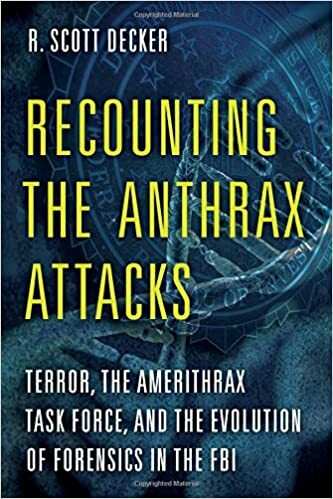 I have no doubt that the recent increase in sales is due to people learning about my book by reading Scott Decker's book "Recalling the Anthrax Attacks." The weekly sales of his book seem to be increasing as more and more people become aware of it. Hopefully, that will also mean the sales of my book will be increasing. April 22, 2018 - I think I've finally found the beginning for my book. Up until now, every time I'd pick a subject to use to start my book, I'd soon realize that I needed to explain something else before getting into that subject. Now it appears that working on my paper about Einstein's train-embankment "gedanken" experiments has brought me to the right and proper place to begin. Before I can describe the first train-embankment experiment, I needed to explain what a "coordinate system" was according to Einstein. And before explaining what a "coordinate system" is, I need to explain what a "gedanken" experiment (thought experiment) is. And that is where I have to begin the book. And that is also where I am beginning my scientific paper about the train-embankment Gedanken experiments. A thought experiment (German: Gedankenexperiment, Gedanken-Experiment or Gedankenerfahrung) considers some hypothesis, theory, or principle for the purpose of thinking through its consequences. Given the structure of the experiment, it may not be possible to perform it, and even if it could be performed, there need not be an intention to perform it. Gedankenerfahrung? That translates to "thought experience." That seems to fit with my April 19 comment where I said the translator of Einstein's book seemed to often use the word "experience" when the word "experiment" would have been more meaningful and appropriate. I really think Einstein meant "experiment" where his translator used "experience." I also learned that "experiment" is both a German word and an English word and it means the same thing in both languages. And that setup will allow me to use paint.net to produce modified versions of that image to illustrate different steps in the experiment as light from the lightning bolts moves toward the observers. And further modifications can be used to illustrate several different Gedanken experiments in which what is learned from one experiment can be an aid to understanding what happens in the next experiment. It seems that may have been what Einstein intended, too, but Einstein was really targeting physicists (even though he claimed to be writing for the intelligent layman), so he spent most of his time writing about alternate theories from history which were either being supported or debunked by his theory, and that often makes his explanations seem almost incomprehensible. 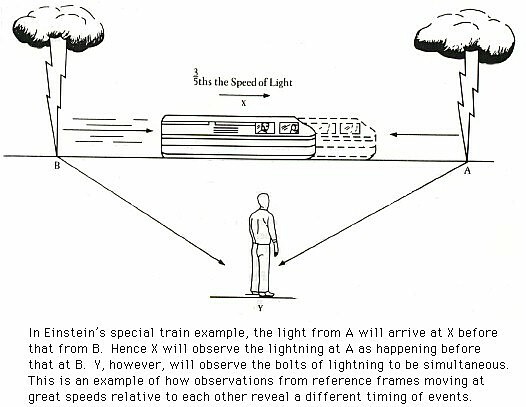 The first train-embankment thought experiment in my paper will be the standard one where OE sees the lighting bolts strike simultaneously while OT first sees the B strike and then the A strike. Somewhere, probably after describing experiment #1, I'll have to define what is meant by the word "true" according to Einstein and I. The second experiment will re-position the B lightning simulator to a point further down the tracks, which will result in OT observing simultaneous lightning strikes while OE observes the A strike first and then the B strike. The third experiment is one which Einstein never described. It will involve two asynchronous lightning bolts which would be perceived as being synchronous by an observer who just happens to be the right distances away from where the two lightning bolts hit. It won't involve the train or the embankment. It will be illustrated by two concentric circles with an observer at the center. When lightning strikes anywhere along the outer circle, the light will move toward the observer. If a second lightning bolt hits anywhere on the inner circle just as the light from the first lightning bolt arrives at any point on the inner circle, the light from both lightning flashes will arrive at the observer simultaneously. And it doesn't make any difference if the observer is moving or stationary. He just has to be at that center point when the light from both lightning bolts arrive. The fourth experiment will be where OT drops a stone as he passes by OE, and while OT sees the stone fall straight down, OE sees it fall in a parabolic curve. The fifth experiment will be an invalid thought experiment as performed by mathematicians where they invalidly imagine the embankment as moving and the train as standing still. I'll explain that, while all motion may be relative, all motion is definitely not reciprocal. And I'll explain how the fantasy of all motion being reciprocal is confirmed to be "invalid" because it violates what is known to be " true" as a result of experiments #1, #2, #3 and #4. Plus, it simply makes no sense in any known universe. The sixth experiment will be about duplicate experiments which are performed by OT and OE inside the laboratories that are inside the closed boxcars. I'm also thinking of adding a seventh experiment which would involve OT walking inside the train from the rear toward the front. It is one of Einstein's train-embankment thought experiments, and it shows that OT's speed is w+v relative to OE, where w is the speed at which OT is walking and v is the speed of the train. OT's speed relative to the embankment is his speed plus the speed of the train. This is then compared to light emitted at the rear of the train toward the front. Unlike with OT, the speed of the train is not added to the speed of the light. And, I might add an eighth experiment where the observer on the moving train experiences time dilation while the observer on the embankment does not. I'm not sure how many pages it will take to do all this, but it will almost certainly be the longest scientific paper I've written so far. And, if all goes right, I may expand it further to create the first part of the book I plan to write. That's my thinking as of this moment. But, as experience has shown, as soon as I make a plan, something happens to change that plan. 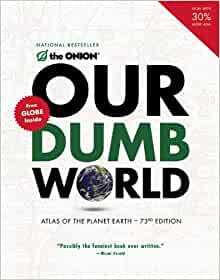 April 20, 2018 (B) - While pulling into my garage after driving home from the gym this afternoon, I finished listening to CD #3 in the 3-CD audio book version of "Our Dumb World" by The Onion magazine. It's an hilarious book and exactly what I needed to listen to after the depressing political book that I'd heard before this one. "Our Dumb World" is a satire, which means there is something in it to offend everyone as it describes one country after another, and many individual States in the United States. For example, it mentions Afghanistan, "Allah's Cat Box," the Ukraine, "the Bridebasket of Europe," and the USA's own Nevada, "Where Everyone's a Loser." One of the last bits that I heard just before pulling into my garage was about Australia, which was originally a British penal colony "because the people of England evidently couldn't think of a worse punishment for their criminals than to send them to a warm and sunny place." After ejecting the last CD of that book, I inserted CD #1 in a 17 CD set for a book about science and what the future looks like for mankind. It will probably take me about a month to get through it. There seems to be only about 42 minutes of listening material on each CD, instead of the normal 70 minutes or so. 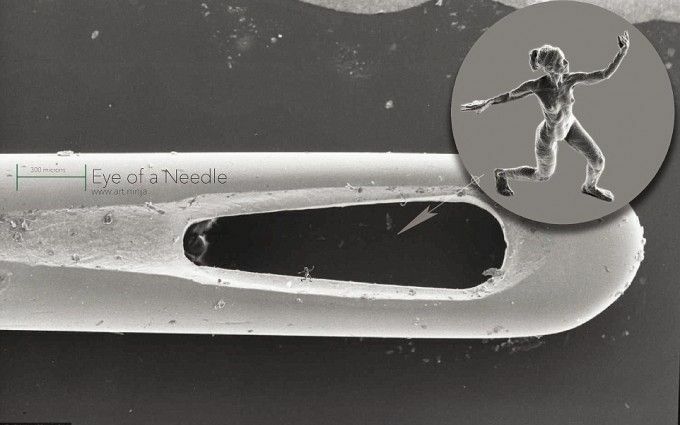 It is about 400 nano-meters long, which means you could put a thousand of them end to end and they wouldn't measure a full inch in total. Here's an interesting sculpture of a woman atop a human hair. It doesn't have anything to do with anything I've been writing or thinking about, but I find it fascinating and worth remembering. Note the scale in the picture above. It measures out 300 microns, which is a little more than 1/100th of an inch. And you have to wonder how many sculptures with their fingertips touching would fit inside that space. There is nothing "stationary" about space. It is emptiness. But Einstein never makes clear why not requiring an "absolutely stationary space" does not mean that "all motion is reciprocal." I can only guess that that particular idiotic idea never occurred to him. He describes all motion of an object as being "relative" to some other object or location, but he seems to say that experiments show that one object is truly moving while the other is not. Unfortunately, in the English translations he also seems to to use the word "experience" when "experiments" would be a more meaningful term. After all, how can you have an "experience" in science without an experiment? It is not difficult to understand why, in spite of this, we feel constrained to call the propositions of geometry "true." Something is "true" if it agrees with the laws of physics and has been demonstrated to be "true" by experiments. The problem then, of course, is that mathematicians have their own screwball interpretations of experiments and of Einstein's postulates. That means that when I say that something is "true" because experiments have shown it to be "true," they'll argue that I do not understand anything and they have experiments which show their beliefs to be true. Sigh. I really need to put all of this into some scientific papers. An observer is anyone who casts a mathematical net over time and space, establishing conventions to describe locations in space and points in time. All in all, there is a plethora of different possible observers - each with a specific way of imposing mathematical order onto the world. The differences lie not only in the different location of the observers, or their different motions, but in the infinity of variations that is possible for conventions of how to choose space and time coordinates. In fact, in our definition, the term "observer" is equivalent to that of "space-time-coordinate system", or just "coordinate system". So, an "observer" is basically equivalent to a "coordinate system"? When I did a Google search for "frame of reference" and Einstein I got a lot of web locations where "frame of reference" is described as being similar to or the same as "coordinate system." And that made me realize that while the terms may be similar in meaning, they are definitely not the same thing. In fact, defining the terms is something that I will have to do before writing almost anything else in the book I've been planning. And it will be a key part of the paper I'm writing about Einstein's train-embankment thought experiment. The train-embankment thought experiment with the lightning bolts is definitely about "coordinate systems." It's about one observer on the moving train and another observer on the embankment. And they are viewed as "coordinate systems" when you compute the differences in what they saw. When you talk about a "frame of reference," however, the key word is "frame." A frame encloses a given space. You are no longer talking about an observer. You are talking about an enclosed area. So, if you use "frames of reference" in a train-embankment thought experiment, it becomes a very different experiment. First, the "frames" become a laboratory inside a moving railroad car, and another laboratory inside an identical railroad car that is parked on a siding next to the tracks the moving train is using. If you want, you can have a dozen observers inside the "frames," since it is the frame that is key to the experiment, not the observers. The point is that you can perform an experiment inside one of the frames and you will get the same results you would get if the same experiment was performed in the other frame. There would be no difference due to the fact that one frame is moving and the other is not. It is only when an observer opens a window and looks outside that he would find out which frame he is in. That makes me wonder if the word "frame" isn't much more clear in German than in English. A quick search through Einstein's book "Relativity: The Special and General theory" shows that the word "frame" appears as part of the word "framework" 5 times and only once as "frame" when he mentions ideas "which have already been fitted into the frame of the special theory of relativity." And in that context, "frame" is a framework of the special theory of relativity. In his 1905 paper on Special Relativity, Einstein only uses the word "frame" once, and it is in its plural form. It is when describing his First Postulate: "the same laws of electrodynamics and optics will be valid for all frames of reference for which the equations of mechanics hold good." And clearly that is not about an observer but about an enclosed framework. Some day, I'll have to examine exactly how Einstein uses "coordinate system" and "frame of reference" in his other writings, but I feel fairly confident that he never used them interchangeably. And when he used the term, the English translation would more accurately be "framework." April 17, 2018 - I'm really trying hard to break out of the arguments on Google's Science, Physics & Relativity discussion forum. But some of the discussion are truly fascinating and educational. I've also decided that now is not the right time to work on a book. I first need to write a couple scientific papers, one tentatively titled "The Two Doppler Effects," which would be about (1) the photon wavelength Doppler effect and (2) the photon frequency Doppler effect, and how each works (as opposed to how college text books claim they work). The other would be about Einstein's train-embankment "gedanken" (thought experiment), which I wrote about here yesterday and the day before. Today I looked through scientific papers I had started writing in the past and never finished. One of them, dated July 27, 2017, is titled "Analyzing Einstein’s Train/Embankment Thought Experiment." It's 9 pages long, but it will have to be totally rewritten, not because it is wrong, but because it views things from a different angle than I now view things. I also brings back to mind some issues I'd basically forgotten about, such as Einstein in his book "Relativity: The Special and General Theory" describing how a man on the train walks from the rear of the train toward the front at speed w, while the train moves at speed v. So, his speed relative to the embankment is w+v. But, if a light is emitted from the back of the moving train toward the front, the light will travel at the speed of light, c, not at c+v. He also writes about dropping a stone out of a window in the moving train and how an observer on the train will see the stone fall straight down, while someone on the embankment will see it travel in a parabola from the window to the ground. Is there a "correct" view? I guess it all depends upon what is meant by "correct." The view from the embankment is certainly "correct" in some ways, and the view from the "train" appears to be only "correct" in that it is what the observer on the train saw. I can imagine a lawyer in court asking, "You saw the stone fall straight down, is that correct?" And the witness would say, "Yes, that is correct." But is it "correct" in any other way? Sigh. Maybe tomorrow I'll have more time to work on the papers. April 16, 2018 - Groan! I'm really feeling overwhelmed. I recently posted recommendations to my library that they buy Kindle copies of Scott Decker's book "Recounting the Anthrax Attacks" and James Comey's book "A Higher Loyalty." While I have a signed hard-cover copy of Scott Decker's book, I do most of my book reading during breakfast and lunch, and I like to highlight things. I don't want to highlight things in the hardcover copy, nor do I want to accidentally splash salad dressing or milk on it. I mention this to someone, and two days ago, that person sent me a link to a 39 page report titled "A Report of Investigation of Certain Allegations Relating to Former FBI Deputy Director Andrew McCabe." It was written by the Office of the Inspector General U.S. Department of Justice. It looked extremely interesting, but I was in the middle of arguing with people on Google's Science, Physics & Relativity discussion forum, and I didn't want to break my train of thought. So, I set the article aside. Yesterday, I wrote that long comment about Einstein's train-embankment "gedanken," and then I argued about it on the Google forum for most of the day. I awoke this morning with the idea that I should write a similar comment about what needs to change in order to make the person on the train see the lightning bolts strike simultaneously, while the person on the embankment sees them strike at different times. All that has to change is that one of the simultaneous strikes has to occur at a different location, a good distance further down the tracks and farther away from the front of the train, not immediately in front of it. I got up anxious to start writing that comment. Then, in this morning's emails, I found someone had sent me a link to an article titled "This Philosopher Helped Ensure There Was No Nobel for Relativity." It's about a heated debate in 1922 between Albert Einstein and philosopher Henri Bergson, which supposedly caused Einstein to not win a Nobel Prize for his theory of Special Relativity, but instead he got one for his theory about the photoelectric effect. I created a pdf file of the article so that I could highlight passages, and I studied it. As I understand it, Bergson was a philosopher who felt that time does not exist except as viewed by humans. Einstein felt that time existed both psychologically and physically, and time would pass whether humans were there to observe it or not. It was an interesting article. So, now I need to decide if I should get into the arguments on the Google forum again or write a comment about my early morning thoughts. I'm going to write about my early morning thoughts. There's nothing very interesting among the overnight posts to the Google forum (except that one comment seems to claim that nothing exists except when viewed by humans). First of all, I wanted to address the question of whether or not there is any "frame of reference" where the guy on the train (me) sees himself as stationary and the railway embankment as moving. Yes, of course there is. That is what my "frame of reference" is all about. All the seats and the floor and ceiling of my railroad car are moving at the same rate and in the same direction I am moving, so they are all "stationary" relative to me. And if there was an airplane directly above me, flying in the same direction and at the same speed, it would also be "stationary" relative to me. And as long as the pilot of the plane was directly above me, we would both see the lightning bolt hit at the front of the train before we saw the lightning bolt hit at the rear of the train. But so what? That doesn't mean we are really stationary. And it certainly does not mean that the person on the embankment is moving. The person on the embankment is stationary relative to the earth. But some reference frame on Mars or near Alpha Centauri will see the earth spinning and moving around the sun, so they will see the embankment as moving. So what? It changes nothing. The train and I will move past the smoking hole where the lightning hit, but the guy on the embankment won't. So there's no debate over who is moving relative to the point where the lightning bolts hit. Even the guy on Mars and near Alpha Centauri will agree that the guy on the embankment does NOT move relative to where the lightning bolts hit. He only moves relative to Mars and Alpha Centauri. But so does the guy on the train. Then, just as you and I pass each other, two lightning bolts strike the train tracks. But, unlike yesterday's strikes, although the A strike occurs in the same spot, the B strike occurs quite a ways away from the front of the train. The light (a&b) from strikes A & B moves toward us at the speed of light. Again, neither of us is yet aware that there were any strikes, since the light has not yet reached either of us. The only difference is that the b light has further to travel than yesterday. The third illustration shows me moving farther away from you while the light from the A &B strikes continues to move toward us. The fourth illustration shows the light from the A strike reaching you. So, at that moment you perceive that there was only one lightning strike. I have not yet seen the light from either strike. The fifth illustration shows the light from both lightning bolts reaching me at the same time, which would lead me to conclude that they occurred at the same time (and they actually did). And then, of course, you will encounter the light from the B strike and conclude that there were actually two strikes, which where not synchronous. And thus, you can argue that the lightning strikes were not simultaneous, while I can argue that they were. And, of course, if we sit down and intelligently discuss the situation, we would realize that the strikes were not really simultaneous for either of us. I just perceived the bolts as hitting simultaneously because of my movement toward one of the lightning strikes. After our discussions we would both agree that in your frame of reference, the lightning bolts actually did hit simultaneously, but you did not perceive it that way because the light from the B bolt had to travel further to get to you than did the light from the A bolt. Like yesterday, today's "gedanken" again had the lightning strikes hitting the earth simultaneously, but this time they were not at equal distances from either of us. There's probably some way that the bolts do not hit simultaneously, yet one of us still perceives that they do, only because of how fast we were traveling in a given direction. But I don't think I'll have time to examine that "gedanken." But it poses the question of who says the strikes were simultaneous. Answer: Einstein says. Humans do not have to be there when two lightning bolts strike the earth simultaneously. It still happens. We can come around later and observe the holes in the ground, their temperature and other remnants that tell us that the two strikes were simultaneous. And I doesn't matter if philosophers agree or not. April 15, 2018 - I'm still heavily involved in arguments on Google's Science, Physics & Relativity discussion forum. A couple days ago, I used Einstein's train-embankment "gedanken" (thought experiment) to make a point about an observer encountering light arriving at c+v where v is the observer's velocity. Since there is no way to use illustrations on that forum, I used typed characters to create a makeshift illustration to help argue my point. Even that was a problem, since the Google software uses variable width characters, and my point is best made with fixed width characters. Anyway, below is one such illustration using fixed width characters. "M" is Me on a moving train traveling a very high velocity (probably around 25% of the speed of light). "Y" is You standing on the embankment beside the train tracks. The first illustration shows me moving toward you as the train moves past you. Then, just as we are next to one another, and I can wave to you as I go by, two lighting bolts (A & B) strike the train embankment simultaneously just in front of the train, and just behind the train. The second illustration shows this. Neither of us is yet aware of the lightning strikes, since it takes time for the light photons to travel to our positions - even at 299,792,458 meters per second. In the third illustration I show photons (a & b) from lightning strikes A & B moving toward us. Meanwhile, I'm moving toward the point where lightning bolt B struck the embankment. In the fourth illustration below, I encounter the light photons from lightning bolt B. Of course, since I am moving toward the source of light b, I encounter the light at c+v, even though mathematicians cannot comprehend such a thing. Meanwhile, you have not yet seen the light from either lightning strike. In the fifth illustration below, you encounter the light from BOTH lightning bolts simultaneously and conclude the lightning bolts hit simultaneously. Meanwhile, I've still only encountered the light from lightning bolt B. So, as far as I am concerned, there was only one lightning strike. Finally, in the sixth illustration below, I encounter light from lightning strike A, which I perceive as arriving at my location at c-v since I am moving way from the source of the light from that strike. This "gedanken" appears to me to be very simple to understand and virtually beyond any argument or doubts. How could anyone not understand or disagree with what happened in that thought experiment? The problem comes from not looking at it from a scientist's point of view, as was done in the presentation above. The problem also comes from having Me and You initially argue about what we saw without having any understanding of what actually happened. I would argue that the first lightning strike (B) hit the embankment in front of the train, and then, some time later, the second lightning bolt (A) hit the embankment at the rear of the train. You would argue that the two lightning bolts hit at the same time. In physics, this called "The Relativity of Simultaneity." Of course, by having the scientist explain what happened, I would nod my head and agree. Although I saw the lightning bolts hit at different times, and almost everyone else who was not in the exact position you were in would agree with me, in your specific location (and any other position equidistant from the points where the lightning bolts hit) you would have justifiably thought that the lightning bolts hit simultaneously. And having the scientist explain things, you would agree that it was just your unique perspective that caused that view. Only mathematicians would disagree. They will argue that I could never see light arriving at c+v or c-v. "Light must always arrive at c!!!!!!!" they would declare and insult anyone who disagrees. And they would somehow declare that there is some "frame of reference" where I am stationary and the earth and you are moving. And they would declare that in such a frame of reference, I would see the lightning bolts hit simultaneously. Then I would argue that that is not possible, and they would argue that they can construct a mathematical model which shows me and the train standing still and the light from the lighting bolts reaching me simultaneously while you on the embankment would see the B lightning bolt hit first, and then the A lightning bolt second. And I would argue that that shows that the mathematical model they created does not represent reality. And I would then explain that I looked outside as I passed the point on the embankment where lightning bolt B struck and I saw the charred earth at that point. Meanwhile, you would acknowledge never having seen or passed that point. So, clearly, I am the one who was moving. And you would nod and agree. And the mathematicians would start hurling insults and calling us names, and they would declare that we must read what they read and take the college courses they take, so that we will believe as they believe - because theirs is the only "true" belief!!!!. Hallelujah! I'm also seeing that I really need to put this in book and/or paper form. But, without that argument on Google's forum I may never have come up with such a clear and undeniable illustration of how the Relativity of Simultaneity works. Even Einstein never mentioned that charred spot on the embankment! I've seen arguments where others did, but they didn't explain things as clearly. April 12, 2018 - I keep planning to write a comment here about what is going on in my arguments with mathematicians, but writing comments here is at the bottom of my daily to-do list, and before I get to it I get into another argument, and before I realize it, the day is over and it is time to shut down my computer. Sometimes the arguments are very interesting and educational, and other times they are exceedingly repetitious and boring. This morning I see there are 211 posts in the thread titled "The #4 Dumbest Belief in Physics" that I started on April 7, five days ago. Only three of the 12 posts made overnight require a response from me. And none seems particularly interesting. So, I can let them wait while I write this comment. In the arguments on the Google forum, I seem to be arguing with people who have memorized slogans and terms, and they cannot discuss anything with anyone who hasn't also memorized those same slogans and terms. The question we're debating is simple: When a stationary radar gun is fired at an oncoming speeding car, do the radar pulses hit the car at c (the speed of light) or at c+v (the speed of light plus the speed of the oncoming car)? As I see it, the answer must be c+v. If the pulses hit the car at c, the gun would register the speed of the car as being zero. speed is defined as comparing the speed of A with the speed of B in reference frame C (in which neither A nor B is stationary). An observer would NOT use the term "closing speed" to talk about a photon hitting the observer. If you tried to do that, A would be the photon, B the observer and this takes place in B's frame where B is stationary in B's own frame. So the 'closing speed' would be the speed of the photon (c) plus the speed of B in B's frame (0 by definition) so we get c+0=c. As I see it, A is the pulse from the radar gun, and that pulse is moving at c. B is the oncoming car which is moving at v. And reference frame C, in which neither A nor B is stationary, is the highway. So, I'm in perfect agreement with his definition. The misunderstanding seems to be about the term "observer." I keep telling them that the atoms in the car are the "observers" who encounter the oncoming pulses arriving at c+v. Evidently, for some unknown reason, he's saying the highway must be the observer. Or is he? He doesn't relate the terms he's using to the radar gun argument. It's like he's just reciting something from memory that he once read somewhere - or was required to memorize in school. No, it does NOT. Because no radar gun actually measures the speed of the light arriving at the oncoming car -- how could it???? -- IT IS NOT AT THE CAR. It is your FANTASY that this is so, and your FANTASY is wrong." I didn't say anything about the radar gun being at the car. I was talking about what the experiment showed. But, how can I explain that to him without getting into another argument over terminology? Or maybe he'll argue that I am using LOGIC and logic is not valid in physics. The closing speed has been checked in many experiments and is always c. The closing speed in Einstein's little scenario is c for both the man on the train, and the man on the embankment. So both the guy ON the train and the guy ON the embankment/station next to him (ideally right on top of him) have the same experience of having the flashes arrive simultaneously. That has to be true, or else causality would suffer. That, of course, cannot be. It would only be possible if the light from the lightning bolts arrived instantaneously. It doesn't. Light travels at 299,792,458 meters per second. So, the guy on the train moves toward the light while the light is traveling, and thus he encounters the light at c+v. Meanwhile, the light from behind the train arrives later, arriving at c-v. For the person on the embankment who is not moving, the lightning bolts would arrive simultaneously. The problem is that the illustration doesn't use the equations "c+v" or "c-v", so there will undoubtedly be an argument over my interpretation. The illustration is from HERE, Texas Christian University's web site. And from a book. So, now I suspect the people on the Google forum will argue that those sources are invalid for some reason. And now I've written my responses here before posting them on the Google forum. The three arguments now seem to be far more interesting than they were when I first read them. I think that is because writing the responses is very interesting and educational. I'm learning from what I'm writing in response, not from what the mathematicians on Google are telling me. 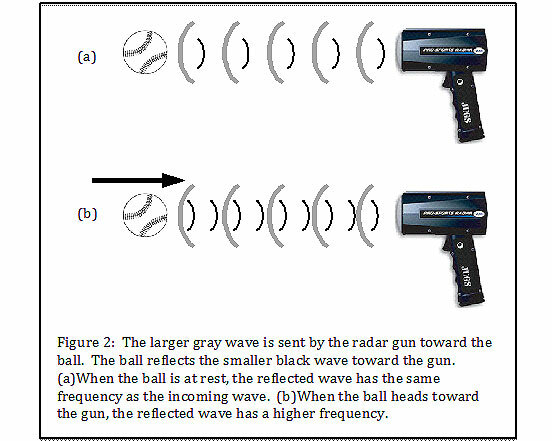 The radar gun emits pulses at a frequency of 1,500,000,000 Hz. The pulses that come back from the speeding car are at a frequency of 1,500,000,150 Hz. The baseball problem is similar, except that the pulses that come back from the baseball are at a frequency of say 1,500,000,120 Hz. The question: What PHYSICALLY happened to cause the pulses to return at a higher frequency than the frequency at which they were emitted? One of the two overnight posts that didn't get my copy-and-pasted question was from Lofty Goat who only asked if I like being "lost" in my discussions on the forum because I didn't speak in mathematical equations. I responded that I didn't feel "lost." I could decipher enough to understand what was going on. Well, Ed, then I guess it's a good thing that nobody first tried to develop a "sonar gun" to detect speeders by aiming a sound chirp at them, since obviously THAT would not work at all, right? The problem with sound waves (sonar) is that they are neither fast enough nor precise enough to measure velocities of really fast moving objects. The whole system fails if an object is going faster than sound. Nothing can go faster than light, so (radar) light (radio frequency) photons are used to measure the speed of very fast moving objects. Since sound travels faster through water than through air, submarines use sonar to locate objects. I remember a lot of WWII movies where everyone listens to sonar pings hitting the hull of the submarine, and everyone gives a sigh of relief as the pings get farther and farther apart, indicating the the enemy ship is moving away from the submarine. The fact that the radio photons return at a higher frequency than the frequency at which they were emitted by the radar gun does not show that the radio photons arrived at the oncoming car at c+v. They may have arrived at c. The first photon may have arrived at c and was sent back at c. Then the second photon may have arrived at c and was also sent back at c. What changed was the amount of time between the emission of each pulse and the re-sending of that pulse. The pulses were sent back at a faster rate than they were originally emitted because they were received at a faster rate. Of course, if there is less time between pulses, that means that the pulses arrived at c+v, but would the mathematicians think about it that way? Or would they use the argument I just wrote? The next question then becomes: Was the wavelength of each radio photon unchanged when it returned back to the radar gun? I think it would be changed, but I don't think the radar gun measures wavelengths, it only measures frequency of pulses. If the returned wavelength was different than the original wavelength, then that would confirm that the light arrived at the oncoming car at c+v. Nuts!! The only good element in this is that the people on the forum do not seem able to work things out logically, and if they could, they wouldn't be able to write out a response in ordinary English. They'd have to write it as a mathematical equation. But, I'll have to wait to see how they respond. Meanwhile, I'll have to think of a better question to ask, one that involves changes in wavelength, not just in frequency. April 8, 2018 (B) - At 4:06 p.m. yesterday afternoon I started a new thread on the Google Science, Physics & Relativity discussion forum. The thread is titled "The #4 Dumbest Belief in Physics." In the message that I used to start the thread I said much the same thing I said here in my April 5 comment. There were zero responses on that new Google forum thread when I turned off my computer at 4:15 p.m. This morning I see 16 responses. Looking over the 16 responses, I see 6 are from people on my "Do Not Reply" list. I'll study those anyway, just to see if they contain anything other than the typical personal attacks and insults. 3 are arguments between other posters, which I'll have to check to make sure I understand what they are arguing about. Three of the responses are from "Paparios" who wrote nothing, he only posted links to five YouTube videos. All five videos are about the Doppler effect. I'll have to try to figure out what point he is trying to make. I'm aware of the Doppler effect, but they are evidently seeing something in it that I do not see. I think what they see has to do with the #3 Dumbest Belief in Physics: "All motion is reciprocal." 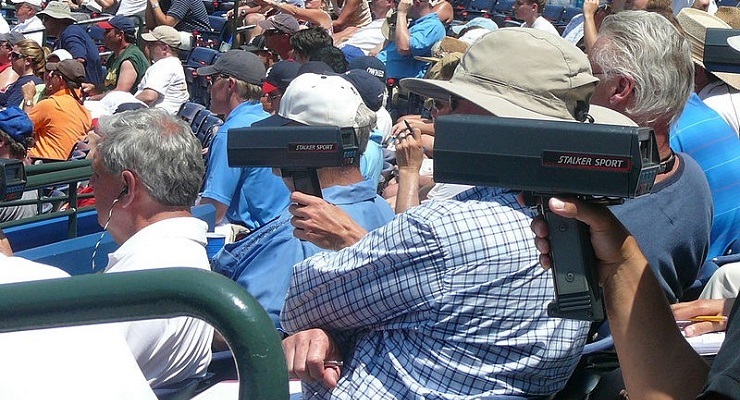 I think (and hope) radar guns may be able to help disprove that belief, too. If you are in a speeding police car traveling at 100 mph and use your radar gun to check the speed of the car you are chasing, if that car is also traveling at 100 mph, the radar gun will show its speed as zero. So, if you had only the radar gun to use to measure speed, it would confirm dumb belief #3. But, in that situation in our real universe, the police would use their speedometer to measure the speed of the other car. So, they have a way to disprove dumb belief #3. What if the other car is going 90 mph or 110 mph? What would the radar gun show? It should show that in the first instance, the speeder's car is traveling at minus 10 mph, which means it is traveling towards the police car, and in the second instance it is traveling at plus 10 mph away from the police car. Again the police can use their speedometer to disprove dumb belief #3. But, is that the best argument to use when I respond to the people on the forum? I also know that the radar gun is the source of the radio pulses being used to measure velocities. And no matter how fast the police car is moving, the pulses from the radar gun will always travel at c. The speed of the source does not affect the rate of the emitted radio pulses. So, if the police car is traveling at 100 mph and the radar gun is pointed at a tree, the gun will show the tree to be traveling at 100 mph. Hmm. If the speed of the source was added to the speed of the light, what would happen? That's going to take a lot more thinking than I have time for right now, so I'll ponder it for awhile. Right now I need to get onto the Google forum and argue there, instead on continuing to argue here with myself. 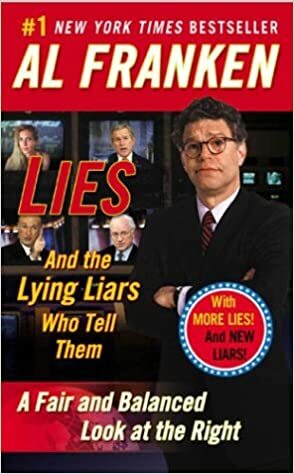 April 8, 2018 (A) - This afternoon, while driving to a grocery store, I finished listening to CD #8 in the 8-CD audio book version of "Lies and the Lying Liars who Tell Them: A Fair and Balanced Look at the Right" by Al Franken. as he became president, Bush managed to spend [Bill] Clinton’s surplus of international goodwill in astonishingly short order. He ditched Kyoto, the anti-ballistic missile treaty, the germ warfare protocol to the Biological Weapons Convention, the Comprehensive Test Ban Treaty, the International Criminal Court, and the land mine treaty. Bush is good at make-believe. He says what he has to say. But he gives tax cuts to his supporters, throws business to his cronies, quietly guts environmental protections, and leaves millions of children behind. He calls himself a compassionate conservative. That's the biggest lie of all. The right-wing media racket let Bush get away with it. When the mainstream media dares to tell the truth about Bush, they're called biased. Back then, Al Gore was playing the role that Hilary Clinton plays today on Fox News and in the right wing media, i.e., they are being attacked as a way of side-tracking the discussion whenever the President does something wrong and/or stupid. The biggest difference may be that back then Ann Coulter may have been the most rabid defender of "W," while today she considers Trump to be a "shallow, lazy ignoramus." While listening to the book I also couldn't help but recall a book I read on my Kindle in February and March of 2015 titled "Thinking, Fast and Slow." "Thinking slow" is thinking logically. "Thinking fast" is thinking emotionally, as you do when you react to a sudden unexpected event or to something you fear or hate. George W. Bush and Donald Trump never seem to think things through, they both seem to think emotionally, instead of logically, and they seem to have been elected by people who also think emotionally instead of logically. People who think emotionally are driven by fear and anger, but mostly it seems they are driven by ego and a need to be viewed as the better than their competitors, whoever their competitors are. They are out to prove that they (and their clan or country) are the better and smarter than any competitor, and they're ready to go to war with anyone or any country that disagrees. Until Donald Trump was elected, I always considered George W. Bush to have been our dumbest President. Now, of course, Donald Trump holds the title of the "all-time dumbest American President," and hopefully he will hold that title forever. I think I was expecting Al Franken's book to be a lot funnier than it turned out to be, but it was still a good book to listen to while driving. But, it turned out to be the title of a satirical piece in The New Yorker. When talking about Trump it is often it is difficult to distinguish between satire and reality. April 5, 2018 - I'd like to try to discuss a specific experiment with the people on Google's Science, Physics & Relativity discussion forum, instead of arguing general physics, which is mostly what I've been doing in the past. So, I've been doing some heavy thinking about which experiment would best demonstrate that light can arrive at c+v when an observer is moving at velocity v toward the light source or at or c-v when the observer is moving from the source. The problem is, no scientific paper (except my own) ever seems to describe things that way, and virtually every mathematician believes light is always measured as traveling at c regardless of the motion of the observer or emitter. The "Annual Doppler Shift" discovered by Hermann Carl Vogel and Julius Scheiner says that light from a star located along the ecliptic arrives at c+v when the earth is moving toward the star in its orbit around the sun, and it arrives at c-v when the earth is moving away from the star. But I can't find a copy of the paper they wrote, and the comments about it in other books and papers are too general. The fact that pulses from pulsars along the ecliptic arrive at a faster rate when the earth is moving toward the pulsar and at a slower rate when the earth his moving away from the pulsar as the earth orbits the sun says that the pulses must be arriving at c+v and c-v. However, none of the many papers on the subject ever uses the terms c+v and c-v, and the authors generally avoid the entire issue by doing all their measurements from the center of the sun. Daniel Gezari's paper on lunar laser ranging implies c+v when he writes about how light from a mirror on the moon arrives at the earth observatory at c+v due to the rotation of the earth toward the mirror, but Gezari doesn't accept what his own calculations confirmed. First, there is a transmitter, which creates a signal (called a carrier wave) at a specific frequency (of whichever band the radar is designed for). We will use as an example 1.5 Ghz, which means that one and a half billion sine wave pulses are created every second. This signal is not modulated like a signal from a radio station would be. That last sentence means that the 1.5 billion pulses each second are evenly spaced in time and are all of the same strength. A radio station modulates its signal so that you'll hear voice and music instead of just a single endless tone. "FM" means "frequency modulation," which says they vary the frequency to cause the different sounds. "AM" means "amplitude modulation," which says the pulses vary in strength or loudness to cause the different sounds. This signal is radiated out toward your car. As the signal spreads out, its strength gets weaker and weaker. ... Various radar guns have different spread patterns, but a block away, the pattern may be about 30 feet in diameter. ... If your car passes through any part of the 30-foot diameter circle (actually, cone), the signal will hit it. A tiny fraction of this energy that is reflected in all directions, happens to be reflected back in the exact direction of the originating radar gun. There is a phenomenon called the Doppler shift, which causes the frequency of any signal radiated from an object (including a reflected signal) to be shifted by a very specific amount. The size of this frequency shift is dependent on the speed of the moving vehicle, and on almost nothing else. For a car going 100 mph (toward the radar gun), this only represents a frequency shift (increase) of our original signal to 1.500000150 Ghz, a VERY tiny change. ... So we get an resulting output (difference) signal of about 150 Hz for the 100 mph car. Lower speeds give lower (difference) frequency. Every frequency corresponds uniquely with a specific speed, virtually exactly proportional to vehicle speed. In summary, radio photons are sent out as evenly spaced pulses at the frequency rate of 1.5 billion pulses per second. The pulses travel at c, the speed of light. However, because the target car is moving toward the source of the photons, the radio photons hit the car at c+v, which means the pulses hit the car at a higher frequency rate than the rate at which they were sent. They hit at a frequency of 1.500000150 billion pulses per second. The atoms in the vehicle that were hit by the photons then emit new radio photons back to the radar gun at the speed of light, c. However, the new photons are emitted at the frequency rate received, i.e., 1.500000150 billion pulses per second. Since the difference frequency is virtually directly proportional to the target vehicle speed, a simple circuit converts the 150 Hz signal into a readout of 100 mph. The equation is f(reflected)=f(source) * Sqr.Rt((c+v)/(c-v)), where c is the velocity of light, and v is the velocity of your car. But I don't know how to use that equation in my arguments. I'd need someone else to use it in a meaningful argument first. I also found a web site explaining how radar guns are also used by baseball fans to measure how fast the pitcher is throwing his "fast ball." The principles are exactly the same as for police radar guns. I've mentioned police radar in discussions with the people on the Google forum before. Their typical argument is that, for all we know, the on-coming car could be motionless in space and the radar gun could be moving, since the earth is spinning on it axis, and it's also orbiting the sun and the Milky Way galaxy. But that's where Relativity comes in. In the frame of reference of the stationary radar gun, the oncoming car is traveling at 100 mph. In the reference frame of the stationary point where the Big Bang occurred, the radar gun may be moving at tens of thousands of miles per hour along with the earth as the earth moves through space, but the car is still moving toward the gun at 100 mph plus or minus the speed of the earth. There is no reference frame where the car is stationary relative to the gun or moving away from the gun. And motion is definitely not reciprocal - except in the fantasies of mathematicians. This all makes perfect sense to me. I can probably find other situations where regularly spaced pulses are transmitted at the speed of light and the pulse rate received is different from the pulse rate of transmission, indicating that the photons were received at c+v or c-v rates, which the mathematicians all say is impossible, and so do the textbooks they read in college. But how can I get an intelligent conversation going on this topic? If I'm wrong, I'd like someone to explain to me where I'm wrong. The fact that what I say disagrees with what is in textbooks doesn't change anything if it is clear that the textbooks are wrong. I wrote about all this in my paper about Einstein's Second Postulate, but I really want to discuss it with someone who has an open mind. Obviously, the image had something to do with time -- or clocks. But what? A little detective work found that it is a cartoon about John Harrison, who was born on April 3, 1693. So, today is his 325th birthday. Harrison is best known for his work on clocks used on ships. His first invention was the H1, a chronological tool used for determining longitude at sea. After testing the H1 in 1735, Harrison worked on later iterations, the H2 and H3, that improved on the original's accuracy. So, it's a good day for me to delve deeper into the question of how time actually works. And that is what I was doing when I noticed the illustration. April 2, 2018 - I'm still mostly thinking about Relativity and Time Dilation, but I decided I should add something about Scott Decker's new book to my blog about the anthrax case. So, this morning I created a new blog page titled "Recounting the Anthrax Attacks." The previous page was added almost three years ago, on April 8, 2015. I was very surprised while researching how Scott's book is being promoted to find a YouTube video promoting the book. The video is very professionally done, and it clearly implies that the book will soon become a TV documentary series or a major motion picture. Hmmm. The idea of making a movie or TV series that depicts Ivins committing the crime poses a very interesting question: How would they depict him writing the letters and addressing the envelopes? He [Hermann Carl Vogel] then went to the Polytechnical School in the city of Dresden, before he enrolled in natural science at the Universit of Leipzig in 1863. By 1865, he was an astronomical assistant at the Leipzig Observatory before he went for his Ph.D. at the University of Jena which he graduated in 1870 when he was the director of the Bothkamp Observatory by recommendation from astronomer Karl Christian Bruhns to whom he was an assistant and his professor Johann Karl Friedrich Zoellner. Here he and his school chum Wilhelm Oswald Lohse (1845 - 1915) began taking photographic images of the spectrum of stars by 1871 when they also found the Sun's rotational period by the Doppler effect of shifted wavelength. To a person who doesn't know what those lines on the spectrum means, it's of no use, but to a person who knows what elements those lines represent, seeing those familiar lines shifted even slightly to the blue or the red side of the spectrum is noticeable. By 1874, he was working at the new Astrophysical Observatory in Potsdam. (AOP) By 1882, he was the director of AOP till his retirement in 1907. By 1888, he and Julius Scheiner were producing such accurate spectral wavelength shift readings that it was made into a paper, "The Determination of Radial Velocities of Stars by Spectrographic Observation". Many others had tried photographic spectroscopy, but he was the first to determine how to do so accurate-enough that he can determine the radial velocities of stars. I've tried everything I can think of to find that paper I highlighted in red. I've even translated the title into German and searched for a German version. No luck. It seems like the paper should show that light from a star along the ecliptic should arrive at c+v when the earth is moving toward the star, and at c-v when the earth is moving away from the star six months later. But why can't I find the paper? Is there some kind of conspiracy to hide such papers? If so, how did the author of that web page find the paper? And why do many of the sources that mention the Vogel-Scheiner findings do so without providing any sources, not even the name of the paper? I might turn into a conspiracy theorist if I can't find it. April 1, 2018 - I'm really beginning to feel overwhelmed by all the things I want and need to do. Once again I have nothing prepared for this Sunday comment, so I'm going to have to write it from scratch. I thought I'd have time to work on writing this comment yesterday, since there was only one post on the Google Science, Physics & Relativity discussion forum that I felt needed a response from me. The post was from "rotchm." "Kenseto" had evidently stopped posting. So, I spent nearly all morning working on a reply to the post from "rotchm." That included time to do research to find quotes from Einstein which I used in my response. Then, when I was nearly done with my response to "rotchm," suddenly a very long post addressed to me from "tjrob137" appeared in the thread. And it was filled with bizarre arguments about how easy it is to measure the speed of oncoming light from distant stars, and how light is always measured to be c, regardless of the motion of the observer. It appears all you have to do is start with a belief that light always arrives at c, then you build a mathematical equation to support that belief. And you call the process of creating that equation "an experiment." So, after I posted my response to "rotchm," I spent nearly all yesterday afternoon writing a response to "tjrob137." That also included doing a lot of research - research that mostly involves finding things I wanted to quote. Then, when I was nearly finished with my reply to "tjrob137," I received an email from retired FBI scientist Scott Decker. The email included as an attachment the final version of his book "Recounting the Anthrax Attacks" in pdf format. He says he'll send me a hardcover copy as soon as it comes out. By November, the Frederick City Police Department made it official: Dr. Bruce Edwards Ivins had deliberately killed himself. With Ivins’s death, proving his guilt before a court of law would not be possible, and we realized that doubt would always linger in some minds. But the totality of evidence could not be ignored: Ivins was the anthrax mailer and a serial killer. His motive? For those who investigated the attacks, we are in agreement: the troubled anthrax vaccine and the looming potential of shutting down anthrax research at USAMRIID, bringing an end to his professional life’s work, coupled with an increasingly troubled mind pushed him to murder, using the weapon he understood best. But personally, I do not think he anticipated killing postal workers, and when he did, he stopped mailing his deadly letters. That's going to enrage all the True Believers who still have their own theories about who sent the anthrax letters. I keep wanting to relate this endless disagreement to the science arguments I'm currently having with mathematicians. When I talk with the mathematicians it seems that each one has his own unique understanding of Relativity and how light works. That's what makes it so difficult to resolve the arguments. I'll be arguing with "rotchm" or "tjrob137" and a half dozen others will join in with their own bizarre arguments. But, it's going to be interesting to see how well Scott Decker's book sells. Is anyone (other than the True Believers and conspiracy theorists) still interested in the case? While there have been lots of other books about the case (including 2 by me), Scott's book is the first book written by an insider in the investigation. I hope it does well. I certainly found it to be a fascinating read. This is the first book about the biggest FBI investigation in history, written by someone on the inside, Scott Decker, who was in charge of the scientific investigation. Then I saw that it could be read as saying that it is the first book about the case. It's not of course. So, I had to go back and remove the comma between "history" and "written." It's the first book about the case written by an insider. There are probably other changes I should make, too. That's what takes me hours to write a comment for the Google forum. I constantly rewrite and revise what I've written until I'm satisfied. And then, as soon as I hit "SUBMIT," I see other things I should have written in a different way. Writing is easy. It's the revising and re-thinking that takes so much time.